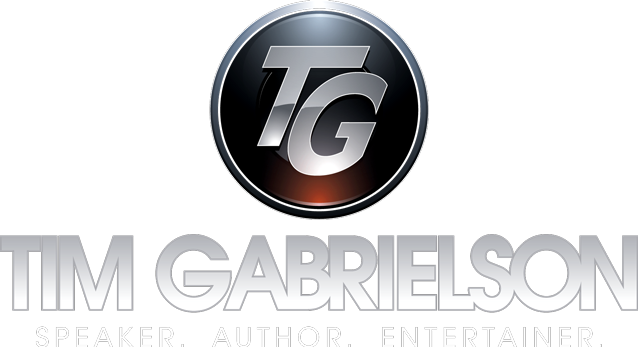 Uncategorized – Tim Gabrielson | Speaker. Author. Entertainer. On Jan. 29, 2017, Tim had the pleasure of partnering with the Rein in Sarcoma Foundation and Win-Win Entertainment for the first time to encourage and uplift those who have been affected by the cancer sarcoma. Win-Win Entertainment provides opportunities for entertainers to give to those who are influenced by misfortune and it is working with Tim to expand the organization by starting a new chapter in Minnesota. 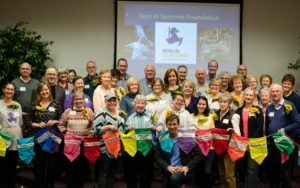 With support from the founder of Win-Win Entertainment, Jeff Civillico, Tim lead the new Minnesota chapter by holding its first event by helping the Rein in Sarcoma Foundation, which is headquartered in Shoreview, Minnesota. The program was started with guest speakers who survived different variations of the cancer. They helped answer questions and encourage patients who might be going through similar situations that they went through themselves. After the encouraging words from the guest speakers, Tim had the privilege of contributing his services to help motivate and bring laughter to the crowd. 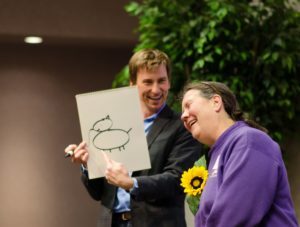 He was able to perform his inspirational blend of comedy and magic for sarcoma patients, survivors, and their loved ones. After the show, Tim also took time to visit the hospital, where he performed for a small group and visited children at their bedsides to help bring happiness and comfort to those who were not able to attend the fundraiser/awareness event. “It feels good to do good,” said Tim. The weekend turned into a great performance where Tim gave back to the community, especially to those who are going through the hardships of sarcoma. The Rein in Sarcoma Foundation is an organization for people who are impacted by sarcoma, a cancer typically found in the soft tissues. This organization helps fund and support research, host activities for educational purposes, and provides encouragement to those who are influenced by sarcoma. For more information about the 501 (c)(3) non-profit organization Win-Win Entertainment and why they do what they do, watch this short video! Win-Win Entertainment Testimonial Video 2015 from Jeff Civillico on Vimeo. 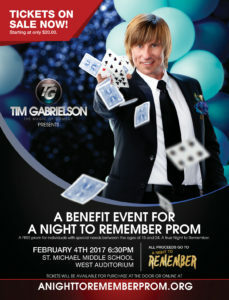 On February 4, 2017, Tim will be performing a family friendly combination of comedy and magic to help raise money for A Night to Remember Prom 2017. A Night to Remember is a free Prom honoring students aged 15-24 with special needs and will be held later this year, on April 30. Honored guests are provided with free tuxedos/prom dresses, accessories, hair styling and makeup by professional cosmetologists, a corsage or boutonniere, a ride in a limousine, a walk down the red carpet (with paparazzi and cheering fans), dinner and dancing, a gift bag and prom photo. The honored guests are partnered with a student who serves as their host and treats them like the stars they are all night. Doors open at 6 p.m. and the show begins at 6:35 p.m.
Jordan Wright specializes in Entertainment Promo Videos, Corporate videos and Video Art. He is amazing at what he does and is great to work with. I highly recommend him for your video needs.